Steel plant handles a huge amount of materials during the production of steel products. This huge amount of the materials is to be moved during the several stages of production. Various types of movements of men and materials which are taking place in a steel plant are described below. The materials movement starts with the receipt of raw materials and fuels which are to be stored and sent to the processing units for their processing. The intermediate products as well as semi-finished products need to be moved for the next stage of processing in the downstream units. The finished products and byproducts are to be dispatched to various customers. Waste products which are produced during processing are to be moved to the waste product processing units or to the dumps. Also steel plant requires store and spares, equipments, consumables, lubricants, utility items etc. in huge amounts which are to be received, stored and moved to the processing units. Steel plant also needs a large amount of water which is required for cooling, processing and many other purposes. This water is also to be received and transported to the places of need. Further a large number of people work in the plant who come to work in various types of vehicles. This vehicular traffic also consists of a big movement in the plant. The total cost of transportation of men and materials inside the plant is quite substantial and hence need a comprehensive and integrated management to keep it under control. Steel plant uses several means of transports for these movements. These movements include rail transport, road transport, conveyor transport, and pipe line transport etc. for inter shop movements while cranes, mono rails with trolleys, fork lifts, roller tables, elevators, and transfer cars etc. are used for intra-shop movements. The steel plant maintains a rail road network (consisting of hundreds of kilometers of rail roads in a multi-million ton steel plant), a fleet of locomotives, a fleet of different types of wagons and ladle cars, and rail road crane. In case of road transport the steel plant maintains a network of roads (consisting of hundreds of kilometers in a multi-million ton steel plant), a fleet of transport vehicles (trucks, pick-ups, and cars etc. ), a fleet of mobile equipments (dumpers, cranes, poclains, and tankers etc. ), and special mobile equipments (pneumatic tank carriers, and vehicles to carry cryogenic liquids etc.). Road network is also being used for people for their movement inside the plant. Conveyor network is used both for movement of bulk materials between the two shops as well as for moving of these materials within the shop. Belt conveyors are normally used for bulk materials both for inter-shop and intra-shop movements. These conveyors are of different sizes, lengths, inclinations, speeds and capacities. For the intra-shop movement of some specific materials sometimes hook- conveyors, power and free conveyors, and chain conveyors etc. are used. Pipeline transport is used in the plant for the transportation of water, other liquids and gases (both fuel and utility gases). There are several pipe networks in the steel plant for this purpose running into several hundreds of kilometers. Pipeline transportation is used both for inter-shop and intra-shop transportation of fluids. Materials within a production shop are moved mostly by overhead cranes, roller tables and transfer cars. In some specific places mono rails with trolleys, fork lifts, and elevators are also used for intra-shop movements. The concepts and the controls for the conveyor transport, pipeline transport and material movement within different shops are decided during the engineering stage of the steel plant. Once these facilities are constructed and commissioned, the movement of materials planned to take place by these facilities are to be only followed during the operation. Operational controls of these facilities for the materials movements are normally integrated with the overall process control of the shop and management is to ensure that these facilities operate at optimum operational efficiencies to meet the needs of the shop. 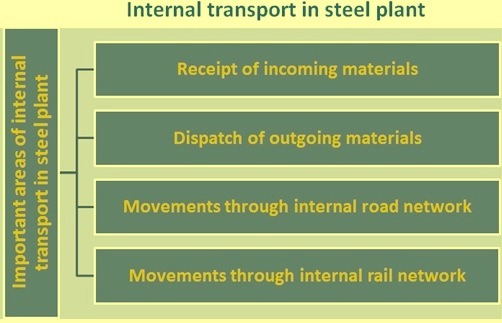 This leaves the following four important areas of internal transport (Fig 1) which are required to be rationally managed within the steel plant. The critical issues regarding effective management in these areas of internal transport are described below. The major raw materials such as iron ore, limestone, and dolomite and major fuels such as coking coal and non-coking coals are received in the plant in rakes of railway wagons. In modern plants the Railways places the rakes directly at the wagon tipplers usually situated in the periphery of the plant. Hence these rakes do not come via exchange yard. There are cases when the raw materials are received in wagons which are not part of the rake load. However such cases are not regular. These cases are namely (i) the receipt of major raw materials and the major fuels in individual wagons which can be due to several reasons, (ii) minor raw materials received in wagons in non-rake loads, and (iii) raw materials received in wagons which cannot be tippled since tipplers are not designed to tipple those types of wagons. Wagons in these cases are taken over by the plant railway system from Railways at the exchange yard. The railway wagons of the rakes are tippled in the wagon tipplers. The tippled raw materials and fuels are then conveyed to their respective storages through the conveyor belt transport. In cases where wagons are not received in rakes, the wagons are unloaded manually on the ground or in a bin. The unloaded materials are then loaded into dumpers and taken to their respective storages through road network. Besides raw materials there are some stores materials which are sometimes received in railway wagons. These railway wagons are directly taken to the central stores and unloaded either manually or with the facilities provided there. There are several minor raw materials, liquid fuels, and stores materials which are received in the plant by road in trucks, trailers, dumpers, or tankers. The vehicles carrying these materials enter the plant through entry gate meant for such vehicles. These vehicles after entry move to the weigh bridge where these vehicles are weighed and then move to the respective unloading points for unloading of the materials utilizing the road network of the plant. After unloading the materials these vehicles are again weighed for tare weight before they go out of the plant. There are normally four types of products which are dispatched from the plants. These are (i) main products, (ii) by products, (iii) waste products, and (iv) materials declared for disposal in the stores. The bulk of the tonnage for outward dispatch comes from the first two categories. In these two categories the bulk of the tonnage is dispatched through rail mostly in rake loads and the balance tonnages in trucks, trailers, dumpers, or tankers by road. Since at the loading points, the rakes cannot be placed directly because of line capacities and loading crane movement restrictions, plant railways takes over rakes with empty wagons from Railways in exchange yard and then breaks the rake and place the wagons at the loading point. After loading the loaded wagons are reassembled and the rakes are formed and then handed over to Railways at the exchange yards. Sometimes the materials are dispatched in railway wagons on ‘said to contain’ basis. Such wagons normally are not weighed on rail weighbridge unless Railways want these wagons to be weighed to check overloading of the wagons. In all other cases wagons are weighed on rail weighbridge before their assembly into rakes. For the materials which are dispatched by road, the empty trucks, trailers, dumpers, or tankers enter the plant through the entry gate meant for such vehicles and these vehicles are weighed for their tare weight. Then these vehicles move to the loading point utilizing the plant road network for loading. After the material has been loaded the vehicles come to the weighbridge for weighing. In some cases where the vehicles are found to be either overloaded or underloaded, the vehicles come back to the loading point for weight adjustments. After weight adjustments the vehicles go to the weighbridge for final weighing. Internal road network of the plant play a very important role in smooth operation of the plant. The road network serves the following purposes. It is to connect adequately various production shops so that movement of people, vehicles and mobile equipments can take place to meet the needs of the production. The roads are to be designed and maintained for carrying round the year the heaviest load expected to move on the roads. The road network is to take care of the traffic density which is usually very high as well as unidirectional during the shift timings. For the movement of trucks, trailers, dumpers, or tankers, the roads are to be earmarked. This type of heavy traffic should not move on all the roads. Movement of these vehicles is to be avoided where there is high density traffic of the people. Usually peripheral roads are earmarked for this heavy traffic. Also frequent patrolling of these peripheral roads by security personnel are necessary since the vehicles plying on these roads carries items which are critical for the sustenance of the steel plant. Level crossings are to be avoided. There should not be any crossing for the road and rail traffic especially in the roads which are carrying high density traffic of the people or heavy traffic of materials. Road flyovers or under bridges are to be provided in such areas of level crossings. Further speed limits are to be enforced on the roads so that there is safe driving of the vehicles without any road accidents. Since the black top roads cannot take water accumulation, they get damaged during the rains. Hence it is preferred to have concrete roads in the areas of high density as well as heavy traffics to reduce the maintenance cost of the roads. At the weighbridge, usually there are a large number of vehicles waiting for their turn to come for weighing. Similarly at the entry/exit gate, the vehicles wait for completing the formality of the paperwork. In order to avoid congestion in these areas and road jams, parking spaces are to be provided away from the road for parking these vehicles during the waiting time. This avoids road congestions and ensures smooth traffic flow on the road. Internal rail network is generally utilized for movements of liquid metals, external railway wagons and transportation of those items inside the plant for which road transport is not suitable. Normally rail movement is isolated from the road movement inside the plant with the help of over-bridges and/or under bridges. However this is not feasible at all the places in the plant. Examples are entry points in various shops where both types of movements (rail and road) are needed. Further in these places, locomotive is always trailing and pushing the wagons/ladle cars and also most of the time there are blind curves. To avoid any accident in such places, it is always desirable that the locomotive moves at minimum speed and there is automatic light and sound warning signals available at the level crossing. Further a signal man is to accompany the wagons/ladle cars with red and green flags (lights) to guide the loco driver and control the traffic at the level crossing. Loco drivers are to follow the prescribed speed limits in a disciplined manner since otherwise there are chances of derailments. The movement at the control speed is also very important when the weighments are carried out on in-motion weighbridge. The weighbridge will give inaccurate weights if the speeds are higher than what is prescribed for weighment. It is very important that regular inspection and maintenance is carried out for the railway tracks. Inadequate maintenance of railway tracks can result into derailments. There are high chances of derailments if the locomotive speed is high because railway tracks at many places in steel plant are with curvatures. Also derailments of ladle cars can happen inside the shop due to the spillover of liquid metal. In such places on the shops, it is also not possible even to bring rail crane for rerailment. Hence availability of hydraulic rerailing equipment is of great help for the rerailing of derailed ladle cars in these areas.